Vered mentions Batman Begins and says how her problem with the movie is that it shows us “the strings that hold up the spaceship”, the view behind the curtain, as it were, or the inside of the paper dragon (to borrow William Gibson’s phrase): it shows us how an ordinary guy becomes the goddamn Batman. It is a severe indictment against this movie that it made this otherwise intelligent woman fail to grasp the essential coolness inherent in the goddamn Superhero Origin Story. That moment, when an ordinary dude or dudette puts on the mask and transforms, becoming something larger than life. Any child that ever played in his or her parents’ closet can grasp this, yet Christian Bale blows it the moment he pokes his identity out from behind the cowl and silly voice to show off to Katie Holmes’ character. You can’t have it both ways: if you wear the costume, you are the costume. Which brings me to the Phantom. He’s a pretty popular comic character everywhere except the USA, where he was created in 1936 (predating the Batman, and Superman too). The Phantom is a costumed crimefighter based in the African jungle, sort of a cross between Batman and Tarzan. He wears purple tights (his creator, Lee Falk, insisted for many years that his costume is gray), he carries two pistols, you never see his eyes in his mask (which is a classic comic convention that doesn’t translate to any more realistic medium), his headquarters is a cave that looks like a skull, he’s got a dog, a horse a falcon, a girlfriend, a tribe of loyal pygmies and a punch that will mark his enemies with the imprint of his skull-ring. The real cool thing about him, though, is that he’s hundreds of years old, “The Ghost That Walks”, but he isn’t immortal: remember Bruce Wayne swearing to fight crime on his parents’ grave? So this shipwrecked sailor, he swore on the skull of the pirate that murdered his father to fight “piracy, greed, cruelty and injustice”, and to have his sons and his sons’ sons follow in his footsteps. Which they have, for 21 generations. 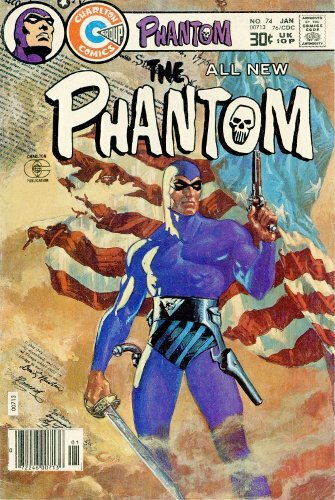 The Phantom of 1776 is indistinguishable from the modern Phantom, except that he carries flintlock pistols instead of 45 automatics. Ben Franklin threatening the Phantom to get off America’s back over slavery. Better to take them out when they’re little, I say. Sadly, I can’t find my favorite Phantom strip online, The Triumph of Evil, which is his origin story, as retold in the first of Don Newton’s comics. Basically, Nazis show up and beat up on the natives; the Phantom takes them on, and goes down. Everyone is sure he’s dead; even the locals, raised on the myth of the Ghost That Walks, are shaken that their protector has fallen. However, his son has been riding home, gets to the skull cave, puts on the tights and mask, and, in a dramatic flash of lightning, rises before his enemies: The Phantom Lives! After his enemies are defeated, the new Phantom takes the skull-ring from his father’s hand and leaves the body in the hidden vault, where the bodies of their ancestors lie. That image, of the hero dying with his mask on, his body hidden by his trusted allies and buried anonymously, secretly; of the son stepping smoothly into his father’s role, donning the mask almost in mid-punch as it were, of a character who remains the same “person”, even though the man behind the mask changes, because those men have shaped their lives for the moment they will have to wear the mask, that is something that sends shivers down my spine and dust into my eyes. So, strange as it may seem, the reason I love the Phantom is that I saw the moment the puppeteers changed, the moment a new person stepped behind the curtain and became the Ghost That Walks. This entry was posted in Comics and tagged Comics, don newton, superheroes, the phantom on April 17, 2009 by Dotan Dimet. 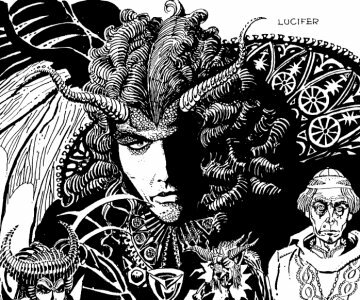 This entry was posted in Comics and tagged black and white, Comics, horror on August 24, 2008 by Dotan Dimet.